Timothy O'Sullivan was born c. 1840, possibly in Ireland but likely in New York City to Irish immigrant parents. Little is known about his early life. He was entered on the confirmation roll at St. Peter's Roman Catholic Church, Staten Island, as "Tim Sullivan" in 1855. He may have apprenticed at a daguerrotype studio on Staten Island but by age eighteen, he was working at Mathew Brady's Photographic Studio in Washington D.C. under the supervision of Brady assistant Alexander Gardner. 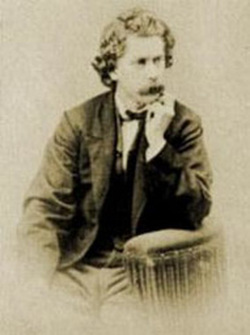 O'Sullivan showed considerable talent and enthusiasm, and, when Civil War broke out, Brady sent him into the field with Gardner to help document the war. Timothy O'Sullivan worked on Alexander Gardner's camera team to document the battlefield dead at Antietam in fall 1862. Gardner's and O'Sullivan's images, when exhibited in New York City, had a profound impact on the viewing public. Gardner, in particular, felt that he deserved some recognition for his work. Yet Brady viewed his master cameramen--Gardner and O'Sullivan--as mere technicians. It was Brady, whose prestige and financial backing for the cameramen, made for success. Brady took all of the credit. Public response to the Antietam photographs, however, encouraged Gardner to break away from Brady to start his own firm in early 1863. Gardner's team, with O'Sullivan as assistant, reached Gettysburg in time to capture a stunning series of photographs of unburied Union and Confederate dead on the battlefield. The Library of Congress credits Timothy O'Sullivan with 47 of these Gettysburg negatives, including some of the most graphic. Gardner credited O'Sullivan for more than half of the negatives in his Photographic Sketch Book of the War, Part Two , and retained credit for all of the final positive prints. Gardner was an early adapter of new photographic techniques and an accomplished cameraman but his forte was the finished print that could be published and displayed. Looking through the lens of the camera, O'Sullivan had a special vision. O'Sullivan may have been the most prolific cameraman of the Civil War. The Library of Congress curates nearly 700 Civil War era photographs attributed to Timothy O'Sullivan. Many others are O'Sullivan's work but are yet to be attributed. This is one of the goals of the Petersburg Project. Detail from "Petersburg, Va. Quarters of photographers attached to Engineer Corps in front of Petersburg." (LC-B8184-7347). This camera setup was used to reproduce maps for the army. Timothy O'Sullivan posed in one of his photographs, April 1865. During the winter of 1863-1864, O'Sullivan set up shop with the Army of the Potomac at Brandy Station where he reproduced maps for the Engineer Department and took numerous images of individual officers, unit portraits, and the winter encampment in general. He accompanied the Army of the Potomac, during the 1864 campaigns and remained during the siege of Petersburg at that time working for the army Engineer Department. The engineers were interested in the fortifications, and fortifications were a focus of much of his post-surrender work. During the night of April 2, 1865, the Confederate army evacuated Petersburg, and the Union army marched in pursuit. Over the next week, Timothy O'Sullivan and his assistant photographed fortifications, likely starting with Fort Sedgwick on the Jerusalem Plank Road, then working north as the areas became more accessible. Afterwards, he photographed Petersburg's buildings, particularly, the mills along the river, evidently as they awaited for days for a pass to follow the armies to Appomattox Court House. By the time, O'Sullivan and his team reached Appomattox, the armies had already moved on. Timothy O'Sullivan appears in a number of his Petersburg photographs, some of which are not attributed to him. These photographs were taken by his assistant, who thus far has resisted identification. Who was Timothy O'Sullivan's Assistant? -- "Vest Man"